A letter to Santa is really the first step in cementing the relationship between your child and Santa. It's where expectations are set and where you can introduce the concept of Christmas lists and Santa visiting on Christmas Eve night. To start your child off believing, you can even ensure that your child gets a reply from Santa by following the Aus Post instructions and addressing your letter to Santa, NORTH POLE 9999. Some children need to be able to visualise Santa to help instil the notion that he could be real. As parents, do you research and find the most realistic Santa you can to take your child to. Fake beards and youthful looking Santa's are often not believable so take the time to find a great Santa that you're happy for your child to meet. 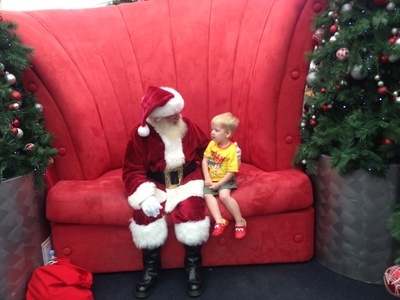 Not all kids like meeting Santa, but if your child is keen, this can be a really magical moment. When my son was 2 he absolutely wouldn't go near the man in red, but now a year later I had to literally prise him away from the lovely old man. If your kid isn't a fan of an in person meet and greet, don't push it. Instead, choose a Christmas book about Santa (e.g. Twas the Night Before Christmas) and get them involved in the main event that way. If you're lucky enough to have a white snowy Christmas, then a fantastic trick is to pull on some big boots and walk around outside your door making Santa's footprints in the snow. For the artistic parents out there, you can even make some reindeer tracks. For those in sunnier climates, don't fear, you can recreate Santa's boot prints indoors, by donning your boots and adding liberal helpings of flour to their soles before walking some foot prints through the house. These floury footprints, will have you little ones astonished that Santa has left his snowy treads in your house. Wow! 4. Don't forget the reindeers. It's not just about Santa either. As all kids know, the reindeers play a vital role in helping Santa deliver presents all over the world. To create a little excitement over the reindeers visiting, make some reindeer food to give to your kids on Christmas Eve to leave out for the reindeers. 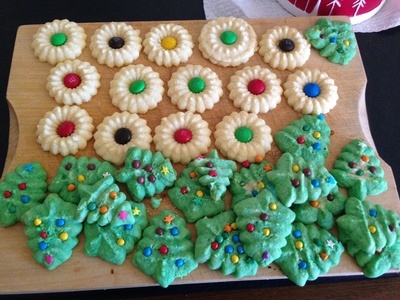 Make up a big batch and package them in cellophane gift bags and give to your friends kids, your nieces and nephews; spreading the Christmas cheer. Easy batches of reindeer food can be made with rolled oats, glitter and other cereals. Just don't forget the glitter, as this magic dust helps the reindeers to fly. Take the reindeer fever one step further, and on Christmas Eve create a pile (or piles) of reindeer poop outside your door step. Easy reindeer poo can be raisin droplets, or perhaps you want to go a little more elaborate and use some brown playdoh mixed with glitter and oats. Don't forget to show your kids what the naughty reindeers have been up to on your porch! 5. Put a treat out for Santa and the reindeers. One of the traditions I loved to do as a child, was to put out some treats for Santa and the reindeers. When I was a kid, this was a mince pie for Santa, a carrot for the reindeers and sometimes a little tipple for the big guy too. Anything the kids think that Santa and his crew will enjoy will suffice. Just don't forget to take a stab at consuming the proferred items, so it looks like Santa has indeed been. So many Christmas stories and carols make reference to Santa coming down the chimney, getting stuck in the chimney and so forth. However, as so many houses are indeed chimney-less, your canny child may well be asking how Santa will make it into your house. An idea (and a craft actvity for the kids) could be to make a special key for Santa so that he can get into your house on Christmas Eve. You can leave the key outside your house on Christmas Eve and this way the kids can sleep easy knowing Santa will still be able to make it into the house. Note: Goes without saying, don't leave your actual key on your doorstep. How far you want to go in getting the kids to believe in Santa is up to you, however, I have one friend who takes the activities very seriously, and this next tip is straight from this family of die hard Santa believers. Get the man of the house, or indeed any man for that matter, to dress up like the man in red himself, and get a polaroid or photo of him in the act. Stage a picture to look like you've caught Santa putting out the gifts, or eating his mince pie, or perhaps leaving the house. Then in the morning, you've got some more proof for the kids that Santa does indeed exist. Kids are getting more tech savvy as the years go on, so this next tip is not something that was around when I was little, but is a great idea for slightly older kids. Try websites such as Track Santa or Norad Santa and you and the kids can use the GPS on Santa's sleigh to track his whereabouts in the world as he makes his way to you. This is a great one to keep excitement levels mounting on Christmas Eve. Another technological offering for today's kids is to get a personal message to them from Santa. The best one I have seen is the free message service from the Portable North Pole where in just a few clicks, your child will be viewing a personalised message direct to them from a beautifully believable Santa. This will have your child speechless. 10. Finally, when all the presents have been recieved, and toys have been tidied away, it's a great idea to get your kids involved in writing a thank you letter to Santa. Real people get thank you letters, and as Santa is real to your kids, he should certainly get included in the thank you notes being handed out. It's a good way to instil manners into your children, but also a way to continue the magic for just a little bit longer. Do you have any other ways in which Santa is kept real in your own house? Do you think kids should learn to play a musical instrument?